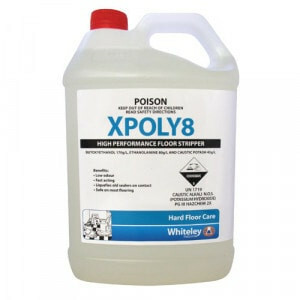 WHITELEY XPOLY8 HIGH PERFORMANCE FLOOR STRIPPER Xpoly8 is a low odour, fast acting and labour saving method for removing floor sealers/finishes with a minimum of scrubbing. Xpoly8 is a new generation floor stripper designed to rapidly liquefy and emulsify old sealers for easy removal with an auto-scrubber or mop and bucket. Xpoly8 is a powerful dual action floor stripper designed to remove metalised and non-metalised floor finishes. Xpoly8 contains a blend of glycol solvents that synergise with a rapid penetration dual chain emulsifier to penetrate the most stubborn old polish films. Xpoly8 can be used on vinyl, vinyl asbestos, rubber, no-wax linoleum, lino tile, marble, terrazzo, ceramic quarry tiles and most types of flooring.